. 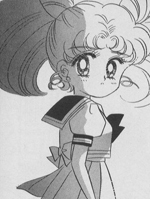 : Lunar Palace v.5 - Manga: Sailor Chibi Moon :. Rini is also called Serenity. Sailor Pluto is Rini's best friend. Rini is really 903 years old.